BAE Systems is scheduled to introduce its proposed design for the U.K. government’s Type 31e frigate program at the three-day Doha International Maritime Defense Exhibition & Conference that will kick off Monday, March 12, in Qatar. 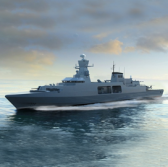 Angus Holt, Type 31e program director at BAE, said in a statement published Friday the company is proud to display at DIMDEX its proposed frigate that builds on the design of BAE’s Type 45 ships, Khareef vessels and offshore patrol ships. BAE partnered with shipbuilding company Cammell Laird in October 2017 to compete for the frigate program. The proposed Type 31e design from BAE and Cammell Laird will work to perform various missions such as maritime interdiction and disaster relief operations and will have a combat management platform. The proposed frigate will navigate at a top speed of more than 25 knots at a range of at least 7,500 miles. Tags: Angus HoltBAE SystemsCammell LairdDIMDEXDoha International Maritime Defense Exhibition & ConferencefrigateGovconQatarType 31eU.K.